The Anthropology Department presents information and insights from the discipline of anthropology, addressing in particular the evolution of the human species and the nature and diversity of human cultures through time and throughout the world. We offer two tracks in the major: the BA in Anthropology with thesis and the BA/BS in Anthropology, non-thesis. If you expect to attend graduate school, the BA thesis degree is recommended. Most graduate programs require a second language (the BA degree) and would like to see that you have experience in independent research design, data collection, and writing (demonstrated by the thesis). If on the other hand you simply enjoy Anthropology but expect to pursue a substantially different career path, the BA/BS non-thesis degree is a good option. You need to decide in your junior year. Consult frequently with your advisor: some courses are offered once a year, some once every other year, and some have prerequisites. Also, your capstone project requires advance planning. Visit the STUDENTS section of the Anthropology page for examples of past project. Begin with the four introductory courses at the 200 level; they may be taken in any order. Next, explore contributions to knowledge in five elective regional and topical courses (300 and 400 level). These may be mixed in with the method and theory courses, but be sure to take ANTH 324 Anthropological Theory and ANTH 325 Ethnographic Methods no later than fall and winter of your junior year. During these two classes you will refine your selection of a capstone project: a three-part sequence for the BA thesis track or a field experience (study abroad or internship) for the BA/BS non-thesis track. A 28-hour minor program to be planned with the help of an advisor. 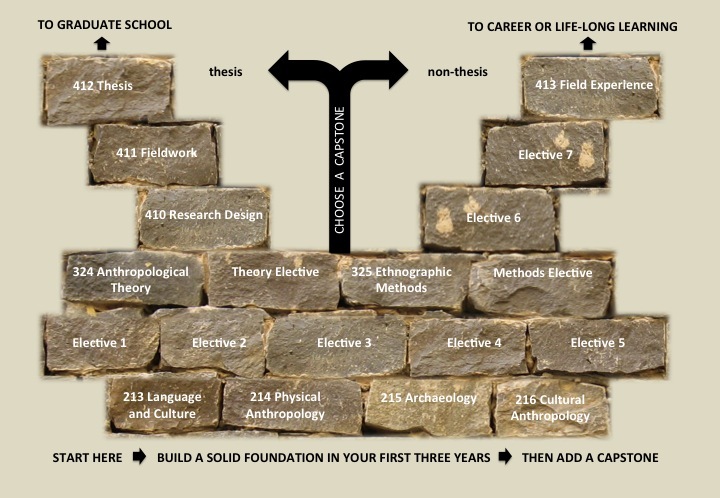 The anthropology minor may be designed to complement your major or to contrast with it. You might wish to strengthen an area of interest or explore new horizons. There are no set requirements except that a minimum of 12 credit hours of upper division (300 and 400 level) coursework is required. Consult any of your anthropology professors for suggestions.